No antenuptial contract? You can draw up a postnuptial contract instead. 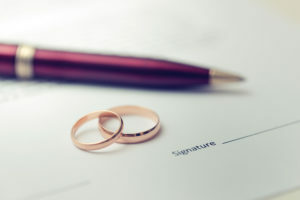 It is becoming more and more common for couples planning marriage to draw up an antenuptial contract (ANC), in which they define the division of property in the event of divorce (see What is an antenuptial contract?). Generally, marriages involving an ANC are out of community of property, that is, each party retains the right of possession of property owned prior to the marriage. Any increases in value of the property after the marriage may accrue to both parties or may remain the property of the original owner, depending on whether the marriage is with or without accrual. If there is no ANC, the marriage is automatically in community of property. In other words, all assets, whether brought to the marriage or acquired afterwards, are the joint property of both spouses and are divided equally in the event of divorce. Traditionally, this afforded women a degree of financial protection. The type of marriage you have…either in community of property or out of community of property, with or without accrual…is called your marital regime. Sometimes a couple decides to change their marital regime. This can happen for a variety of reasons. The most common is that no ANC was drawn up before the wedding, and at a later date the couple chooses to change the regime to out of community of property. This may be because of subsequent independent business interests of one or both parties or simply because the couple married some time ago when ANCs were less prevalent. Both parties must agree the change of regime, but it is not sufficient to have an attorney draw up a new contract (called a postnuptial contract). The postnuptial contract must be approved by the High Court. Approval is rarely withheld, but certain conditions must be satisfied. The Court will want to be convinced that the following requirements have been fulfilled before granting the change of regime. There must be sound reasons for the proposed change. These must be fully motivated in the application. Sufficient notice of the proposed change must be given to all creditors of the spouses. Creditors must be named in the application. The Court must be satisfied that no other person will be prejudiced by the proposed change. This could be a child of the marriage or other dependant, and the application must contain a statement specifying that there is no prejudice to any third party. Notice must be given to the registrar of deeds, as per section 97(1) of the Deeds Registry Act. The draft postnuptial contract proposed must be annexed to the application and initialled. Notice of intent to make the application must be published in the Government Gazette and two local newspapers at least two weeks before the application will be heard. The notice must expressly state the date the application will be made and allow any interested party to make representations in writing to the registrar of the High Court. Two weeks’ notice must be given by registered post to all known creditors of the spouses and a list of creditors must be included in the application, together with proof that they have been given notice. The application must include information about both parties’ assets and liabilities so that the Court can be satisfied there are sound reasons for the proposed change and determine any possible prejudice to a third party. There are a few additional technical requirements which your lawyer will go through with you to ensure a compliant…and hopefully successful…application. Simon Dippenaar and Associates are experts in family law. We have handled hundreds of antenuptial and postnuptial contracts and can ensure your application meets all the legal requirements. Contact us on 086 099 5146 or 076 116 0623 or email sdippenaar@sdlaw.co.za. For more about being married and going insolvent click here. This entry was posted in postnuptial contract and tagged agreement, contract, postnuptial. Bookmark the permalink. ← Accrual: to accrue or not to accrue?